Last year, vinyl guru Jack White was named Record Store Day's honorary ambassador. 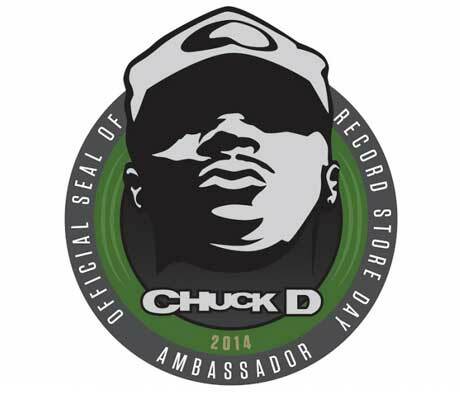 Now, the annual event has announced the ambassador for its 2014 edition: Public Enemy rhymer Chuck D.
That's Chuck's cool-looking RSD logo above. As his first act as ambassador, the rapper shared a lengthy statement about his love of good ol' fashioned record stores. While Chuck D noted that he's a fan of modern technology, the rapper explained that he loves brick and mortar stores for their role as places for music lovers to gather, interact and watch in-store performances. He observed that some of the most important moments in music history have occurred thanks to record stores. Read the full statement below. Record Store Day will take place on April 19, and we can expect to hear a whole lot of announcements about exclusive releases in the coming weeks. Over 27 years and 93 countries visited, as a professional lead vocalist of the RAP group Public Enemy, I don't go one single day without emphasizing that the genre of hip-hop is spawned from DJ culture. The founding members of Public Enemy were, and still are, DJs. The tool and fuel for DJs has forever been recordings. And where these recordings have long connected, with pros and fans alike, has simply been The Record Store, the connection point of listener and the recording. The introduction of the available recording to the public had opened and webbed the sounds of the world across the planet long before the www. It has been influential to the creators of so many of the greatest recordings as well, sort of a second rite of passage after the live radio or TV performance. Motown's Berry Gordy had a record store, Elektra founder Jac Holzman had a record store, the STAX label had their Satellite Record Shop right next to their studio. Keith Richards opens a conversation with Mick Jagger as teenagers on a UK train platform because he had a stack of hot blues records in his arms after leaving a shop. Well you should have an idea of what I'm saying here. The record store made musicians listen beyond themselves. It both complemented and supplemented the radio, in fact the best radio stations in the past followed the vibe of the record stores of their regions, thus growing and nurturing each other. The fans and listener had everything to gain, and if they wanted to get into making music, the Record Store turned into their first school and sonic passport out. Do not get me wrong, I am a fan of technology, but I am a bigger fan of the music. I used to be a big fan of the industry of music when it, like sport, at least offered a seemingly fair field of play, no matter where one came from. Upon the growth of Hip Hop through vinyl-cassette-Cd-MP3 I long wanted, and advised, many Record Stores ways to adapt to surviving the ICE AGE. Like last year's Record Day Ambassador, the great Jack White, I concur with his view that people want to gather, share thoughts, and suggest music. There's few musical events more exciting than Record Store performances, whether it's Grimey's In Nashville, Criminal Records in ATL or Rough Trade in London. I've long thought The Record Store tour circuit is so necessary and rewarding.